We are trying to find a place to moor the boat. While our mast raising system works, it is still a pretty labor intensive operation to make the boat ready for launch and put it back on the trailer at the end of the day. It would be much better if it was in the water for the summer. Or alternately in dry storage on land, with the mast up. Unfortunately, every slip in the north end of Lake Washington seems to be full. Ideally, we'd find a slip for about $200 a month, five minutes from our house, for May through September each year. And pigs can fly. We went out and looked at a slip on Portage Bay, between Lake Union and Lake Washington. We also looked at using dry storage at Sail Sand Point. The Sail Sand Point dry storage only allows hand launch boats. Ours is a little too big for that. There is another dry storage place in Bellevue, but it is undergoing maintenance and closing for a time. After another fabulous day, we pulled her out. First launch was a success! The day was not without its share of hiccups, which we've been warned is standard operating procedure, but it was a great day nonetheless. Not only was it our first attempt at launching our new-to-us boat, it was our first attempt at launching any boat...Ever. We were of course a little nervous. We had gone over all the things we'd need to do the night before and made lists. We got up super early, dragging ourselves and the kids out of bed, excited by the prospect of a fun day out on the water, a new adventure for us all. We were blissfully unaware of all the things we didn't yet know! Once the trailer was hooked up to the car, we drove down to the boat ramp, arriving before 6:30am, to make sure we'd be able to get our choice of parking spots from which to step the mast. Trailering the boat with our Caravan is pretty much right on the limit of what it can handle, but as the trip is less than 3 miles from house to boat ramp, it's very doable. Backed in, wheels chocked, ladder set up and cabin open. We set about the task of raising the mast. With the mast propped up and walked back, the mast bolt went in without any trouble. We started hooking up the gin pole, but soon realized we couldn't get the jib halyard to budge. With the mast head now well out of reach from the boat or the ground, we scratched our heads for a bit before realizing the 2 inch strap securing the gin pole to the mast had been accidentally wrapped around the jib halyard as well, underneath the mast and out of sight! With the jib halyard freed, the mast went up relatively easily, alternately cranking, then stopping a couple of times mid-raise to free shrouds that were determined to get caught on each and every protruding cleat, cam or bolt on the deck. With our mast raising system, only the two forward shrouds and the rolling furler jib (which incorporates the forestay) have to be removed and reconnected/retensioned. We'd decided that for our first run, we'd just get the boat off the trailer and motor over to a nearby public dock and hang out, and tie up for the night in another nearby marina's guest moorage. With the mast up and secure, we started loading the rest of the things we'd need for our day out. Water, check. PFDs, check. Lines, check. Keel raised, check. Gas can.......gas can......DOH! We drove off this morning without loading the gas can, kind of a must-have for motoring. We quickly unhooked the trailer from the van and Greg drove back home to get the gas can. While waiting for Greg to return, a very nice and curious guy named Charlie came over and asked me about how we went about raising our mast. Charlie it turns out also has a Catalina 22, in the water just a few houses away from the boat launch. I showed Charlie the pieces of our mast-raising system, explained the mechanics of it and gave him my email address to send him a link to the construction details. Little did I know that just a little while later, Charlie was going to be my guardian angel! We have a Dodge Caravan. This is not the ideal vehicle for hauling a boat around. For one, its maximum towing capacity is 3500 pounds, which is near what we are hauling around. We probably wouldn't want to tow the boat across country, but it is fine for taking it a few miles around here. Second, it is front wheel drive. Towing a vehicle usually works best with a rear wheel drive vehicle. Third, is is close to the ground, especially the trailer hitch. When we went to put the trailer on the van, we found that the straight hitch mount we had put the trailer too close to the ground. We needed one that brought the trailer up about four inches. We headed off to our local U-Haul for a new hitch mount. 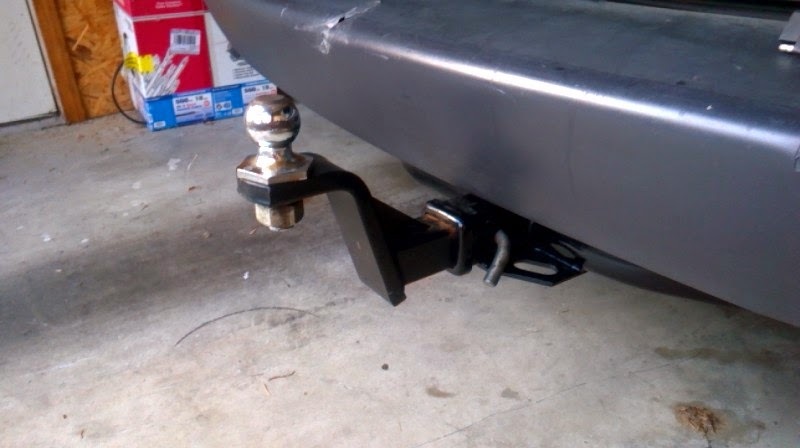 After we got there, we realized that the hitch mount that raises the trailer up four inches is also the one that lowers it four inches...you just mount the ball on the other side. It just so happened we had one of those at home with the ball on the wrong side for what we needed. After spending half an hour with some monkey wrenches, we got the ball off and moved to the other side and remounted. Problem solved! When connecting to the trailer, it's at the right level now. Sanded down the teak. This is a job in progress and will continue over time. The Catalina 22 drains. Clearing these from time to time is necessary. The Catalina 22 has two drains in the forward part of the cockpit that empty into plastic pipes below deck. These then empty through a seacock into the volcano under the boat. The holes in the drains are fairly big, and quite a lot of debris accumulates in these plastic pipes. One side was completely clogged, and the other was mostly clogged, keeping water in the cockpit. We detached the hoses and cleaned them out. We tried out our mast raising system. With some problems to solve, it worked! In the picture you can see the gin pole attached to the front of the mast. (e) Read from left to right. The numbers on our boat are not right as there are no spaces between the groups. We will fix our numbering next year when we get the new annual registration stickers, as we cannot move the ones for this year. We will get the annual registration stickers in exactly the right spot and then put new registration number stickers on the hull with spaces or dashes. The trailer hitch wiring was installed by the guy at U-Haul. It's a little awkward, as it is inside the back of the van. 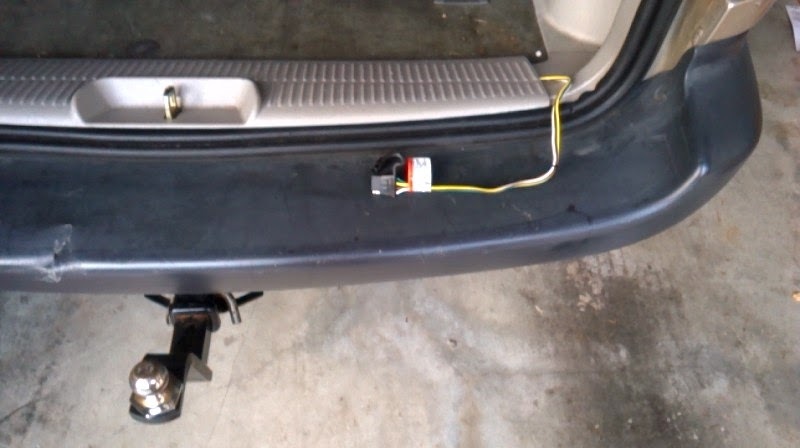 You have to pull the wiring through the back and lower the tailgate over it. It compresses into the gasket, but it can't be that good for the wiring. We were fortunate to know a guy who knows a guy who could come out and repair the wheels on the trailer. David and Chris completely repaired the wheels. Inspected and found stuck master cylinder, leaking wheel cylinders and saturated brake shoes. Installed new brake master cylinder, both rear wheel brake assemblies, clean and repack wheel bearings with new seals. During installation one fitting broke which needed new fitting and reflared for proper seating, bleed brakes and test operations. Cost: $843.24 + 80.11 Tax = $923.35. We had the local U-Haul install the trailer hitch. Unfortunately, the wiring wasn't in stock and had to be ordered. 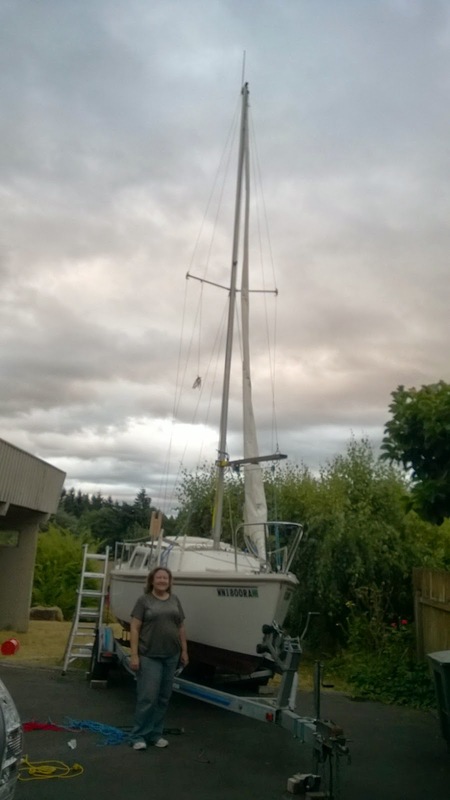 At the time that we bought the boat, we noted that the mast step was a little loose. The bolt and screw holding the mast step allowed the step to lift a little above the deck of the boat. Sandi had already looked into this. She wanted to put a new Mast Step Halyard Plate under the mast step anyway, giving it six points to clip various lines onto. While we were on vacation, Sandi had ordered new stuff from Catalina Direct, including the Halyard Plate ($39.95) and a Mast Step Mounting Kit ($12.95). She removed the mast step by unbolting it, and removing the screw that sinks through the deck into the top of the post in the cabin. We decided to use the longer of the two screws supplied as it bit into the wood a little better. Adhesive was applied and the Mast Step Halyard Plate was put down, followed by the Mast Step. The adhesive needs five to seven days to cure, preventing us from putting the boat in the water for a while. At this point, we still do not know for sure that she floats. The sail tape was needed to repair a 1" tear in the mainsail. It's a must for any sailboat maintenance kit. 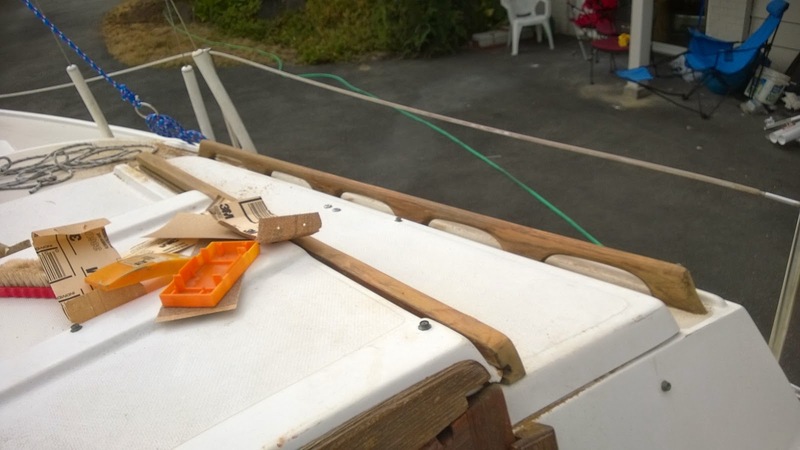 The batten set was ordered since two of the four mainsail battens were broken into multiple pieces. The cost of replacing just two individual battens was essentially the same as buying the entire batten replacement kit. Warning: The new batten kit comes with fiberglass batten rods, plastic end caps, and adhesive to attach the end caps. Be very careful when handling new fiberglass batten rods—use gloves! Sandi learned the hard way that they are covered in fiberglass splinters that embedded themselves into her skin pretty much anywhere she touched them. After getting several fiberglass splinters while gluing on the first end cap, she decided to sand them down gently with some very fine sandpaper. It worked great. No more fiberglass splinters and no need to worry when handling them to put them into or remove them from the mainsail. We have created a page on using the Loos Tension Gauge, because the instructions may as well have been written in Rongorongo.